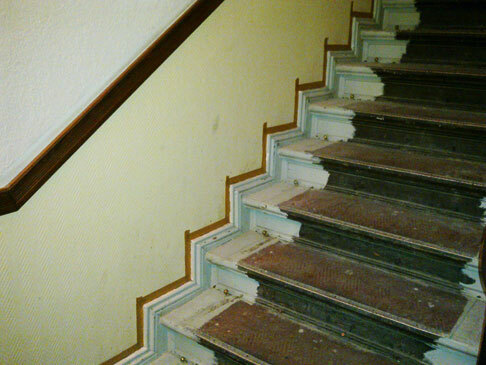 We had some tradesmen in our apartment building this week to renovate the stairwell. It was a bit depressed looking and the old carpet was a bit naff; so time for a refresh. So the first tradesmen on the scene were the ‘stairs guys’. These guys pulled the old carpet and re-laid some new stuff, and cleaned the bits of brass that run along the edge of each step. They also re-painted the little wooden skirting boards that run along the side of the floor and each step; a nice, soothing blue. Before they painted, they went very carefully along each step and each skirting board and put masking tape on the wall above the skirting, so that their paint wouldn’t mark the walls. It’s a 5 storey building, so I’m guessing it was the better part of a day to mask it properly. Here’s the fun part: two days after the stairs guys were gone, the ‘wall guys’ turned up to paint the walls. Before they painted, they went very carefully along the skirting boards and put masking tape along the top, to make sure they didn’t spill paint over the freshly painted skirting boards. How often do you see this in your projects and products? How often do you see decisions made and solutions implemented that solve a problem for one link of the chain without considering the whole, end-to-end product? The thing with working in silos is that it encourages “not my job” thinking – as in, “I could do something about this problem, but it’s not my job to fix it”. How many times do you hear a sentence like: “the testing environment is slow because we use a database server from team x and we do not have any control over it.” I hear it often… I heard exactly that sentence today. Siloed thinking and “not my job” thinking seems to be a natural evolution of scaling up, especially when you scale quickly. Once it’s in the company culture, though, it’s hard to weed out. Better then, if you can, to catch it as it happens. This entry was posted in Agile, Software management and tagged silos. Bookmark the permalink. True. I also realised after I had published this post that the stairs were painted in oil-based paint, and the walls were done in water-based paint – which means the blue would have probably shone right through.